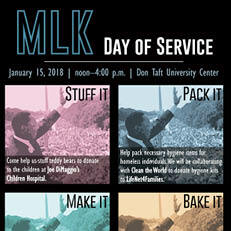 Join SLCE for this year’s MLK Day of Service for four different volunteering opportunities. Come help us stuff teddy bears to donate to the children at Joe DiMaggio’s Children Hospital. Help pack necessary hygiene items for homeless individuals. We will be collaborating with Clean the World to donate hygiene kits to LifeNet4Families. Support the local animals in Broward County. 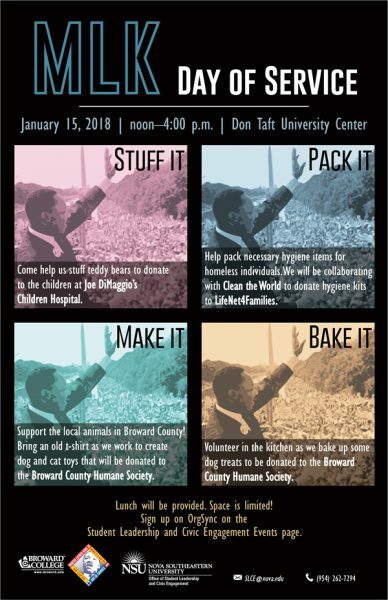 Bring an old t -shirt as we work to create dog and cat toys that will be donated to the Broward County Humane Society. Volunteer in the kitchen as we bake up some dog treats to be donated to the Broward County Humane Society. Lunch will be provided. Space is limited! Sign up on OrgSync on the Student Leadership and Civic Engagement Events page. I am interested and I will be there to help Packing the hygiene kits.